The Isaacs Gallery Ltd., Toronto; Mr. and Mrs. James Bacque, Toronto; Private Collection, Toronto. - The Isaacs Gallery Ltd., Toronto; M. et Mme James Bacque, Toronto; Collection particulière, Toronto. O Toronto, The Isaacs Gallery, Toronto, 1972; Various Artists, Retrospective Exhibition, The Art Gallery of Brant, Brantford, May, 1974. Also shown at the Tom Thomson Memorial Gallery, Owen Sound; the London Public Library and Art Gallery, London; the Brampton Public Library and Art Gallery; Brampton and the Kitchener-Waterloo Art Gallery, Kitchener; William Kurelek; painter, illustrator, author, an exhibition organized by the Canadian High Commission, London, England, 11 January to 8 February, 1978. - O Toronto, The Isaacs Gallery, Toronto, 1972; Artistes divers, exposition rétrospective, Art Gallery of Brant, Brantford, mai, 1974. Également exposée à la Tom Thomson Memorial Gallery, Owen Sound; la London Public Library and Art Gallery, London; la Brampton Public Library and Art Gallery; Brampton et la Kitchener-Waterloo Art Gallery, Kitchener; William Kurelek; peintre, illustrateur, auteur, une exposition organisée par la Canadian High Commission, à Londres, Angleterre, du 11 janvier au 8 février 1978. 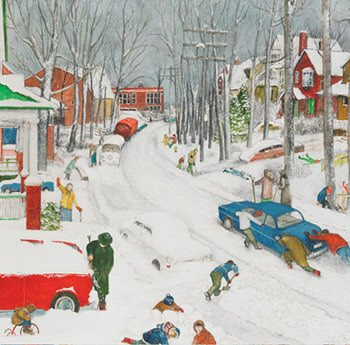 William Kurelek, O Toronto, Paintings and Notes by William Kurelek, Toronto, 1973, plate 9, reproduced in colour. Also reproduced in colour on the dust jacket. William Kurelek, Kurelek Country, Toronto, 1975, page 73, reproduced. William Kurelek; painter, illustrator, author, exhibition catalogue, Canada House Gallery, Trafalgar-Square, London, England, 1978, catalogue cover, reproduced. Patricia Morely, Kurelek, A Biography, Toronto, 1986, pages 174, 207, 247, 250 and 281. - William Kurelek, O Toronto, Paintings and Notes by William Kurelek, Toronto, 1973, plaque 9, reproduit en couleur. Également reproduit en couleur sur la jaquette. William Kurelek, Kurelek Country, Toronto, 1975, reproduit page 73. Catalogue pour l’exposition, William Kurelek; peintre, illustrateur, auteur, Canada House Gallery, Trafalgar-Square, Londres, Angleterre, 1978. Également reproduit sur la jaquette du catalogue. Patricia Morely, Kurelek, A Biography, Toronto, 1986, pages 174, 207, 247, 250 et 281.